As the song goes ... Who was that man? I'd like to shake his hand! This is just outrageously clever. 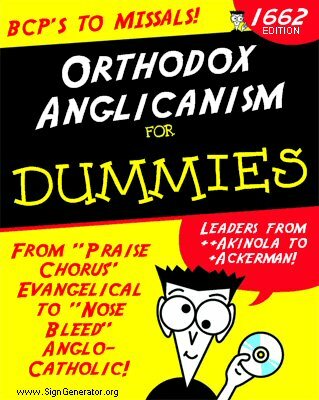 Not to mention that such a book is actually desperately needed. If any knows the creator of this, please let me know. Or if it is you, please step up and be congratulated! 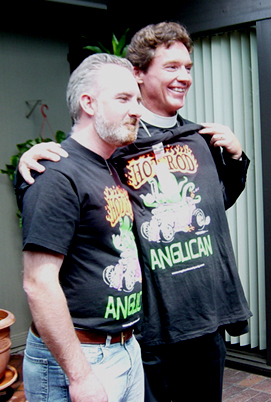 Here is photographic proof that the Hot Rod Anglican worldwide dominion crusade continues apace. The priest is my friend Fr. Paul Howden, who until 2006 was Rector of St. Luke's REC, Santa Ana, CA. Fr. Howden is now the Pastor of Grace REC, Scranton, PA . The other gentleman is Andrew Matthews.